A highlight for me of the Abbeydale Picture House Revival weekend was watching the first film ever shown there, The Call of the Road, with Vincente Stienlet, the grandson of the architect of the building, Pascal J Stienlet. As Mr Stienlet pointed out afterwards, his grandparents almost certainly watched the same film, in the same space, on the opening night in December 1920. There is, to our mutual regret, no material about the Abbeydale in the archive of the Pascal J Stienlet & Son practice. However, Mr Stienlet showed me some fascinating images and plans of what was probably Pascal Stienlet’s largest cinema commission, the Majestic Cinema, City Square, Leeds. 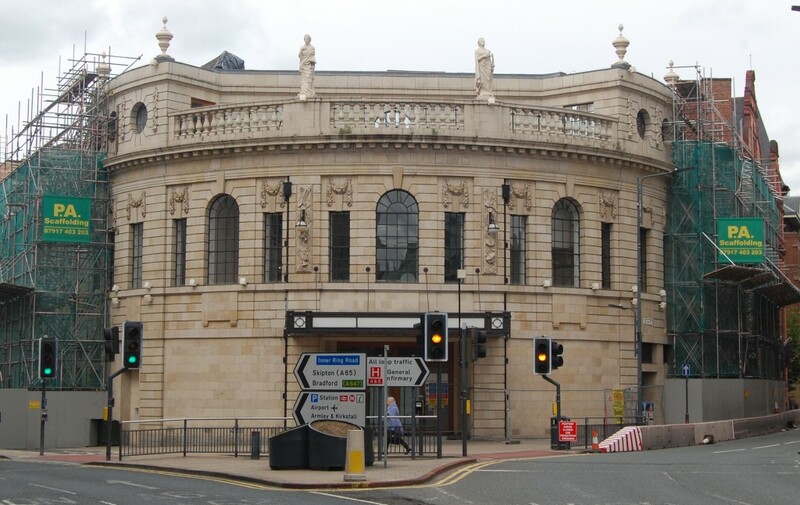 The old Majestic is a much loved Leeds landmark. Designed by Pascal Stienlet in partnership with Joseph C Maxwell, and opened in June 1922, its dignified Beaux Arts façade, of Burmantofts ‘Marmo’ terracotta, is a delicate cream which for years was darkened by Leeds’ polluted atmosphere. In the 2,600-seat auditorium, giant fluted Ionic columns and a Grecian frieze based on the Parthenon supported a coffered dome 84 feet in diameter. On either side of the proscenium were the pipes of the three-manual Vincent organ. In the basement below was a restaurant 110 feet × 110 feet with a sprung floor for dancing. The Majestic became part of the Gaumont chain in 1929, and remained a premier film venue well into the 1960s – its run of The Sound of Music extended from April 1965 to September 1967 – but it went over to bingo in 1969. It’s unusual among city-centre cinemas because it was never subdivided. It was listed Grade II in 1993. In 1997 the entire building became two night-clubs, the Majestyk in the auditorium and Jumpin’ Jacks in the ballroom below. It was closed in 2006; an application for a casino licence was refused and the site became vacant. In 2011 the Leeds developer Rushbond financed a clever refurbishment for retail use. When the redeveloped building was almost ready for opening it caught fire on the evening of September 30th 2014. The fire brigade declared a major incident, closed off much of the city centre for over twelve hours, and by their skill and good judgement, though they lost the roof, saved the exterior walls. Within a matter of days a 32-year-old man was arrested in connection with his suspicious behaviour at the scene. He was cleared of all charges in March 2015: http://www.yorkshireeveningpost.co.uk/news/latest-news/top-stories/leeds-majestic-blaze-man-cleared-of-arson-charges-1-7183724. It remains to be seen what happens next. Yorkshire Post images [http://www.yorkshirepost.co.uk/news/main-topics/local-stories/what-sparked-majestic-inferno-1-6872539] suggest that at least some of the interior remained intact. The story of the Majestic is neatly encapsulated in a Yorkshire Evening Post article – http://www.yorkshireeveningpost.co.uk/news/latest-news/top-stories/proud-history-of-a-leeds-landmark-1-6871416 – and there is an illustration of the interior in original condition at http://cinematreasures.org/theaters/2718. This entry was posted in Fun Palaces on July 27, 2015 by Mike Higginbottom. 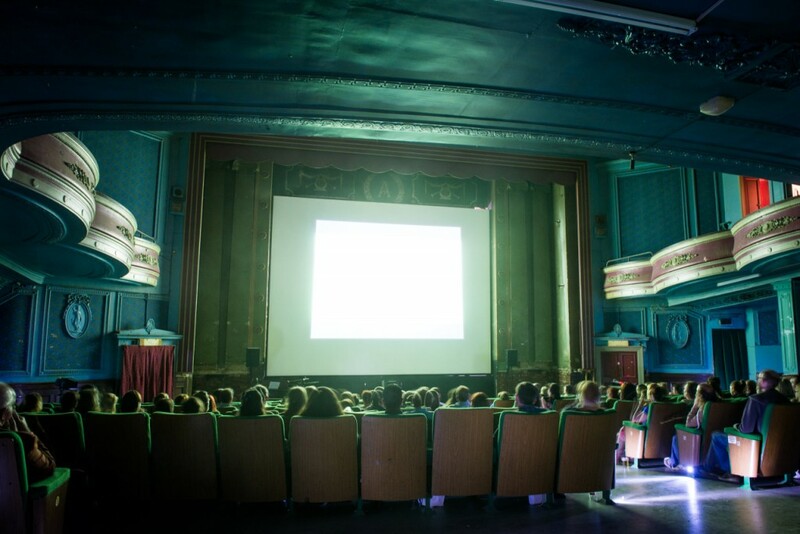 For the first time in forty years, a sizeable audience sat in the stalls of the Abbeydale Picture House, Sheffield’s finest surviving suburban cinema, and watched feature films on the big screen over the weekend of July 18th-19th 2015: http://www.thestar.co.uk/what-s-on/out-about/video-sheffield-picture-house-revived-with-film-festival-1-7359851. Thanks to the inspired vision of the arts platform Hand Of, run by three recent Sheffield graduates, Rob Hughes, Louise Snape and Ismar Badzic, several hundred people – some of them from surprisingly far afield – experienced this very special building doing what it was designed to do, making people happy. Pullman-style seats – more comfortable than the originals – were installed, together with three bars, one of which sold sarsaparilla, the traditional temperance drink of pre-1960s Sheffield. Outside in the car-park there was a rich choice of street food and cakes; in the foyer, the distinctive fragrance of popcorn hung in the air. The choice of films touched on Yorkshire’s film heritage – Brassed Off (1996) and Four Lions (2010) – and the Abbeydale’s heyday – two Laurel & Hardy titles, the short Brats (1930) and the feature A Chump at Oxford (1940), together with the first feature-film ever shown at the Abbeydale on its opening night, December 20th 1920, The Call of the Road, starring the British boxer-turned-actor Victor McLaglen. The Call of the Road was a very special opportunity to see a silent movie as it was originally presented, on a big screen, with a fully improvised piano accompaniment by the virtuoso Jonathan Best [https://www.youtube.com/watch?v=XAJdJ7iSrMM]. Any other experience of pre-1929 feature films pales in comparison with watching a clear print, run at the correct speed, with live musical accompaniment in a crowded auditorium. The afternoon was made even more special by the presence in the audience of Vincente Stienlet, grandson of Pascal J Stienlet who designed the building, and Cynthia Allen McLaglen, the niece of the film-star Victor McLaglen. The Abbeydale has been very lucky in its owners since 1975 – the office-equipment dealers A & F Drake Ltd who found a use for the place into the early 1990s, the Friends of the Abbeydale Picture House who made use of it up to 2012, and the current owner Phil Robins who is developing it as a multipurpose community venue. The Picture House Revival was a huge step forward in bringing the place back to life. Thanks to Rob, Louise and Ismar, the place was lit up on Saturday and Sunday evening, and after the end of the show crowds of people poured out on to the street, smiling: http://picturehouserevival.tumblr.com. This entry was posted in Fun Palaces, Life-enhancing experiences, Sheffield's Heritage on July 21, 2015 by Mike Higginbottom. Churches, like other buildings, don’t get built by accident. They owe their existence to someone’s drive and strength of intention. On the opposite cliff to the splendidly archaic parish church of St Mary, Whitby, stands the magnificent late-Victorian Gothic church of St Hilda. Built to serve the Victorian streets of the West Cliff, St Hilda’s is an impressive Gothic Revival composition of 1884-6 by the Newcastle architect, R J Johnson. It replaced an iron church at the instigation of an ambitious rector, Rev Canon George Austen, who had arrived in Whitby in 1875 from Middlesburgh, where he had initiated a church-building programme [http://www.st-barnabas.net/history], and saw no reason why Whitby and its surrounding parishes should not become a bishopric. Consequently, St Hilda’s is fit for a bishop, embellished with fine carving and glass by C E Kempe. The bishop’s throne was installed c1908, and the first suffragan Bishop of Whitby was eventually appointed in 1923, by which time George Austen had become a Chancellor of York Minster. When he died, aged 94, in 1933 he was, at his own request, brought back to Whitby and buried in the churchyard of St Mary’s, which had otherwise been closed to burials for sixty years. 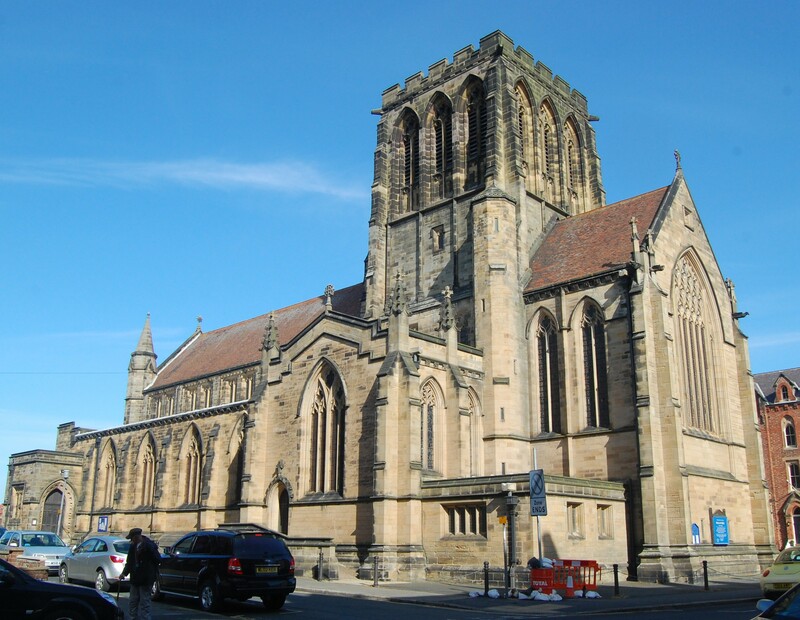 The fine Roman Catholic parish church by Matthew Ellison Hadfield (1867) in the town centre is also dedicated to St Hilda – a source of perennial confusion to visitors. This entry was posted in Sacred Places, Victorian Architecture, Yorkshire's Seaside Heritage on July 16, 2015 by Mike Higginbottom. For a place that has always been far out of the way, Whitby has a remarkable tenacity as a holiday resort. Even before the early arrival of the railway, the Whitby Public Baths Company tried to promote sea-bathing at the foot of the West Pier, where baths were “replenished with the purest sea and fresh water; and are fitted up with the greatest regard both for the comfort of the valetudinarian and the gratification of the pleasurist”. A further attempt to utilise another spring led to the building of the Victoria Spa in Bagdale in 1844. Neither of these projects was a lasting success. A locally-sponsored Whitby Building Company issued a prospectus proposing fourteen lodging-houses on the West Cliff Fields in 1843. Hudson proceeded, under the auspices of the York Building Company, to construct boarding houses and hotels as a speculation. By the time East Terrace was finished so was Hudson, discredited by his manipulation of railway finances. Whitby achieved modest growth as a resort: its population grew from 10,989 to 12,051 between the 1851 and 1861 censuses. Mrs Elizabeth Gaskell stayed here in 1859, and accumulated background material for her novel Sylvia’s Lovers (1863). Other nineteenth-century authors who visited Whitby include Alfred Tennyson in 1852, Lewis Carrol in 1854, Charles Dickens in 1861 and his friend Wilkie Collins, who wrote the novel No Name (1862) while staying in the town. The Punch cartoonists John Leech and George du Maurier were visitors respectively in the 1860s and 1880s and incorporated Whitby scenes into their published work. The West Cliff Estate passed to the self-made industrialist Sir George Elliot, Bt (1814-1893), who projected the Royal Crescent (John Dobson 1876-9) and the West Cliff Saloon and Promenade (1880, now the Spa Theatre). One look at the architecture of the Royal Crescent and the gothic Church Square behind it (St Hilda’s parish church itself dates from 1884-6) tells the tale of over ambition and half-completion. There were simply not sufficient Mrs Gaskells to fill the place. This entry was posted in Fun Palaces, Victorian Architecture, Yorkshire's Seaside Heritage on July 11, 2015 by Mike Higginbottom. The instantly recognisable ruin of Whitby Abbey on the cliff-top above the harbour is freighted with fourteen centuries of history. Founded in AD 657 by a Northumbrian princess who became St Hilda, it was the location for the Synod of Whitby (AD 664), which established that the English church would follow Roman rather than Celtic custom. Nevertheless, St Hilda’s Saxon abbey was designed in the Celtic manner, for parallel communities of monks and nuns, living in single cells but worshipping together. Of the monks in her time five became bishops; two of them, like her, became saints – St John of Beverley and St Wilfrid of York. A lay member of her community was Caedmon, traditionally regarded as the earliest English poet. The first abbey was destroyed by the Danish invaders in AD 867 and refounded in Norman times by one of the knights who fought at Hastings, Reinfrid, who settled here as a monk and developed a Benedictine community in the 1070s. The existing ruins represent a massive rebuilding, starting in the 1220s, continuing after a fundraising effort in 1334, followed by a distinctive break when a change from lancet windows to Decorated tracery indicates an interruption to the rebuilding programme of perhaps a hundred years between the thirteenth and fourteenth centuries. The final installation of the now-vanished Perpendicular west window was only completed in the fifteenth century. Shortly after the Dissolution, in March 1540 the abbey precinct passed to Sir Richard Cholmley of Kingthorpe, near Pickering, “the great blacke knight of the North”, whose son, Francis, adapted the abbot’s lodging to make a residence. His descendant, Sir Hugh Cholmley (1632-89) aggrandised his residence Abbey House with an imposing classical Banqueting Hall wing (1672-82), the shell of which houses a modern visitor centre. The Abbey ruins served as a waymark for mariners, but what now remains is only a vestige. Much of the church, including the tower, still stood in 1711, but the south transept collapsed in 1736, the south wall of the nave in 1762, the nave arcade in 1793, the west window the year after, the central tower on June 25th 1830 and part of the presbytery in 1839. What was left of the west front was bombarded by the German battle cruisers Von der Tann and Derfflinger on December 16th 1914, and later reinstated, with a section of the nave arcade reassembled incongruously by the north boundary wall, after the Ministry of Works took over the site in 1920. There are easier ways of visiting the Abbey and the nearby church of St Mary than by walking up the 199 steps from the town. There’s a discreetly hidden car-park, and a tourist bus running a half-hour service during the summer: http://www.coastalandcountry.co.uk/openTopCoach.html. 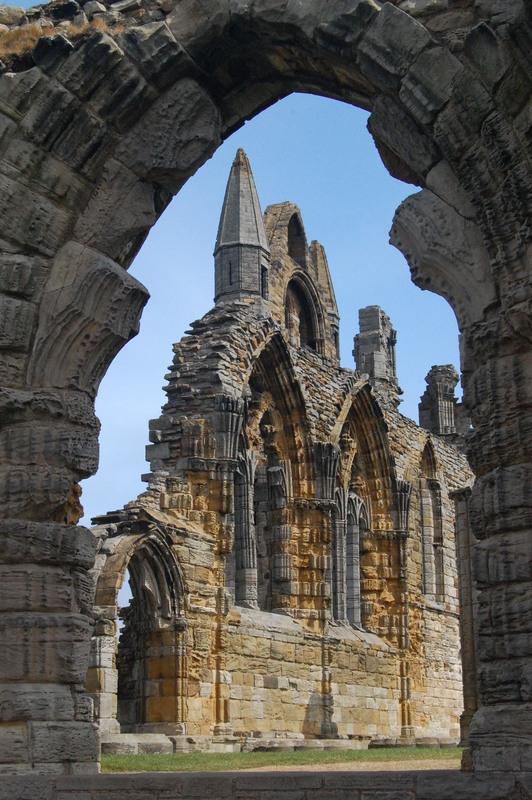 Opening times for the Abbey are at http://www.english-heritage.org.uk/visit/places/whitby-abbey. This entry was posted in Sacred Places, Yorkshire's Seaside Heritage on July 6, 2015 by Mike Higginbottom.